Some technical stuff, like span tables for joists and roof rafters, we just didn't have room for in the Haynes manual. Other technical aspects - like staircases and private drainage systems - will only be of relevance for a very few home-extenders, so we've put the relevant info here. In remote rural areas without the luxury of public sewers, you traditionally had a simple choice when it came to dealing with foul waste: you had to either build your own private sewage works or be prepared to empty a lot of buckets. The old-fashioned cesspool (or cesspit) comprised an underground chamber storage tank into which your foul �solids� and �soil� waste would be flushed. It would need to be located some way out in the garden (at least 7m away from the house). Construction would typically be the same as a manhole, of rendered brick walls on a concrete base, but with a reinforced concrete sealed lid for access. The general idea is that, over time, the solid waste settles at the bottom and the relatively clear liquids are drained off safely into a handy nearby field by way of a land drain, rather like a soakaway. When full, cesspits require emptying by a suction tanker. But in order to reduce the need for frequent emptying (and the associated cost) one popular illegal dodge was to wait until the District Surveyor had approved the new structure and safely departed, and then �accidentally� knock out one of the bricks so fluids could seep away into the ground. Perhaps it wasn�t fully appreciated that leaking cesspits had, not so long ago, been the cause of fatal cholera epidemics as a result of contaminated drinking water in nearby wells and streams. Today, prefabricated plastic or GRP units are available, although cesspools have now largely been superseded by more sophisticated septic tanks. 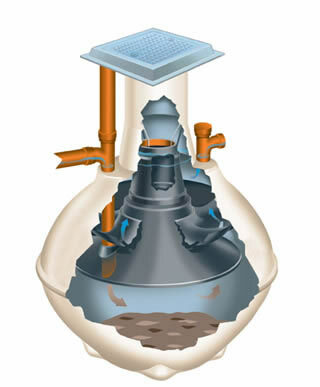 Septic tanks work in a similar way to cesspools � the foul waste �solids� settle over time with gravity, and are partially broken down by bacteria (under a scum or crust on the surface). They are more efficient at separating the solid and liquid matters, employing a system of several chambers. The �refined� liquid finally disperses into approved land drainage and percolates off into the ground. This process means that septic tanks can be smaller than cesspools and are cheaper to purchase. The solid waste matter that cannot be broken down further by bacteria accumulates as sediment at the bottom of the chamber, so periodic emptying will also be required by a suction tanker, despite ambitious claims to the contrary from some proud owners! The tank location must therefore allow sufficient access for the emptying truck, unless this is a DIY job that you particularly relish � in which case you may choose to recycle the waste, which by all accounts can make an excellent fertilizer. In Victorian times, the �nightsoilmen� would empty privies in large towns to sell the contents for just such a purpose. The nature of the subsoil is an important factor to consider when designing private drainage systems. For example, in clay soil the percolation rate may be poor and an extensive system of perforated pipes over a larger area may be needed. Because the discharge is not entirely pure, the installation must be approved by the Environment Agency as well by Building Control. Today, more advanced large-volume septic tanks can be placed in an excavated pit just below ground level. These are environmentally friendly plastic or fibreglass units, some of which are effectively mini-sewerage treatment works that take the process one stage further, treating the liquid by-products so that they�re discharged as �clean� water. Traditionally used since Victorian times in places where high strength was needed, such as at shallow depths under roads or foundations. Iron could withstand impact and distortion, but the joints (often caulked with lead) could be prone to leakage. Acid conditions, such as peaty soil, can accelerate corrosion. Most drains constructed up to the 1950s will be of fired clay, commonly in 100mm or 150mm (4in or 6in) diameters. These were traditionally salt glazed with a glossy, water-resistant finish. But the salt glaze manufacturing process caused vast amounts of pollution, so from the 1970s on clay pipes were no longer glazed and these have proved to be just as good. The joints were caulked with hemp yarn and cement mortar forced into the sockets, which could seep inside (hence the old custom of dragging a ball of sacking through newly laid pipes). Such rigid joints are extremely susceptible to damage from ground movement. Clay pipes remain popular today because of their resistance to chemical attack and their modern flexible plastic couplings. Mainly used for �big bore� underground pipes of 150mm diameter and upwards, the weakness of concrete pipes is their vulnerability to chemical attack from effluent on the inside (acids and sulphates) or from the surrounding groundwater outside. 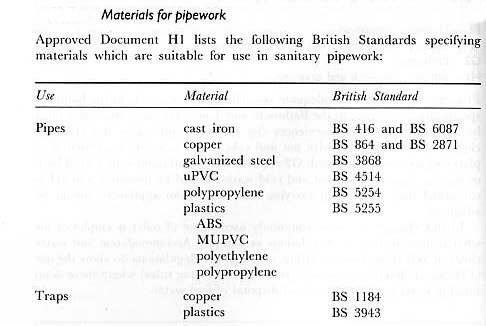 Concrete pipes were commonly jointed with cement mortar, which is unlikely to have remained watertight. Their use should be restricted to carrying rainwater only. Now mainly used for infrastructure projects and manufactured with protective coatings. For generations, asbestos cement was a wonder-material (light, strong, cheap etc) that seems to have been used throughout the house, including soffits, flues, and even ceilings. More rarely, it even found its way into underground pipes. Unfortunately, it was soon discovered that asbestos pipes, like concrete, could deteriorate from attack by chemicals. Some lasted only six years before developing serious leaks. They must not be cut, drilled or disposed of without professional advice. Very popular around the mid-1960s, there will be many existing installations with pipes made of flexible �pitch fibre� or asbestos fibre impregnated with sticky black pitch (bitumen tar). Unfortunately these could sometimes be a little too flexible, being squashed into an oval shape by the weight above if not properly laid. Work starts by laying a 150mm thick concrete base onto which half-round open gulley pipes are laid. Any incoming branches joining the chamber are formed at a �streamlined� angle � like an arrow - in line with the direction of flow. Entry and exit pipes must be cut so they extend a little just inside the walls of the chamber before terminating, and are fitted with a flexible coupling to allow for settlement. 1: 1 sand / cement screed and then trowelled to form a smooth surface. The remaining sections of the chamber are then placed on top, bedded in mortar to the required height. The finished structure should be surrounded with about 150mm of concrete. The top section is specially moulded to take the frame for the airtight lid. If your IC is located on a patio, a special recessed �self- fill� lid can be fitted, and filled with matching patio slabs or tiles. 1. Excavate a hole of appropriate size (typically around 3 cubic metres) for the total roof area and volume of water discharged, located at least 5 m away from the foundations of the house and the boundaries, in accordance with advice from Building Control. In heavy clay soil a deep trench type soakaway may be suitable. Always oversize soakaways as they are prone to silt up over time. 2. Link the hole to the foot of the downpipe next to the house by digging a shallower trench and laying 100mm underground pipes with a gentle fall of about 1:100 towards the soakaway. 3. Fill the soakaway hole up to the level of the trench with large pieces of masonry, rock or rubble (e.g. broken bricks & tiles, not sponge-like aerated concrete blocks) around the sides to prevent the sides caving in. Leave large gaps between the pieces as, when complete, these will need to fill with water prior to its final dispersal into the surrounding ground through natural seepage. 4. Place the end of the pipe so it discharges roughly into the centre of the soakaway. Then add more rubble to cover the pipe, except at the end of the pipe which must be left clear so that any debris carried in the water will fall down into the pit rather than accumulating at the point of discharge and blocking the pipe. 5. Backfill the pipe trench, first with gravel around the pipe, then soil. 6. Place about 100mm of gravel around the top of the soakaway. Cover this with a heavy-gauge plastic sheet prior to covering with at least 100mm of concrete ideally incorporating some form of inspection access. Finally, once the concrete has cured, it can be hidden with topsoil for plants and grass. 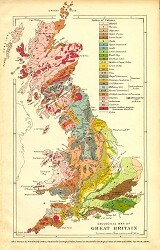 Finally, mark the soakaway location on your plans for future reference. If you find yourself bogged down with a disagreement that can�t be resolved, you may have a genuine dispute on your hands. This means an independent third party will need to be appointed as adjudicator. Exactly who this nominated person should be must be jointly agreed in the contract at the outset. It�s normally an experienced chartered surveyor. Never appoint the person who designed your extension, since it may turn out that some problems are due to bad design. Disputes should always be dealt with promptly, as they�ll only get worse if ignored. If the problem is due to building work that�s below par, and the builder has refused to rectify it, then a good first course of action is to ask the Building Control Officer�s opinion (although officially they may only be at liberty to point out any contraventions of the Building Regulations). Otherwise, arrange for an inspection by the nominated independent surveyor, who should be able to produce a list of defects. A site meeting will need to be held to discuss it. If both sides regard an issue as �a matter of principle� it usually means they feel bloody-minded enough to waste time trying to teach the other side a lesson. At this point calm down! It�s silly to fritter away time and money and to spoil a relationship for the sake of being proved right about a few minor issues. Of course shoddy workmanship, continually broken promises and matters of dishonesty need to be directly addressed. The usual solution is mediation, where a third party with expertise in the field attempts to get both parties to agree a solution, making a judgement after listening to both sides in turn. If the builder still refuses to co-operate, you may be forced to resort to legal advice to enforce the terms of the contract. Consumer legislation designed to protect customers from unfair treatment may sometimes be appropriate. If formal court proceedings are required, it helps to retain signed photographs of the defects in question. It is important legally that you�re seen to have given the builder every opportunity to rectify the problem. With a possible court appearance in mind, try to keep a cool head and always be reasonably civil. Reported episodes of �site-rage� won�t reflect well on you in court, regardless of extreme provocation. Alternatively, you may find that a solicitor�s letter threatening action has the effect of a warning shot, saving both parties from having to go to court, ultimately allowing the matter to be settled more amicably. � Failure to start work or to deliver any materials for a considerable time after the agreed start date. This doesn�t apply if he�s just a bit late starting. � Poor quality workmanship, if much of the work is of exceptionally poor quality and he has failed to make reasonable attempts to put it right after being formally requested to do so. Poor progress, if the project falls way behind schedule, with many days of absenteeism on site, and it looks like the contract will have to be significantly extended. He then fails to improve productivity despite formal requests to do so. Other serious breaches might include the contractor going bankrupt, or extremely aggressive or abusive behaviour. Don�t fall into the trap of being provoked into spouting a lot of abuse back! No matter how much you think they deserve it, a threatening attitude on your part not only escalates the tension but could also expose you to a builder�s claim for loss of profit. All subcontracted work is automatically cancelled when the main contractor is terminated. This is Big Potatoes, and legal advice will be needed. Once the dust has settled you�ll need to appoint another builder to finish the job, for which they may well charge a premium. The requirements for disabled access in Part M of the Building Regulations mainly apply to new houses, rather than home extensions. However it's not a bad idea to incorporate some of the design aspects, such as shallow gradient ramps to allow almost level thresholds and wider doors where possible. Such features are a real boon for kids, pram pushers, and oldies. But the regulations may also have some influence on the design of your immediate garden area. - Ramps built to the steepest permissable gradient of 1:12 should be no longer than 5 metres. However, ramps at shallower gradients such as 1:15 or 1:20 can be up to 10 metres long, without a landing. - Ramp should be at least 1500mm wide. - Normally steps are not allowed. But on steeply sloping sites it may be impossible to avoid having some steps, which must have a rise of no more than 150mm and a minimum width of 900mm. When building any wall, it's essential the courses at each corner are at the same height. A simple gauge board �ruler� can be used to check. This is a strip of straight timber roughly 2 m long with the heights of each brick (or block) course marked on it, including the thickness of each mortar joint, normally 75mm (65mm + 10mm). Hold it up against each corner to check that the courses are at matching heights. On uneven ground, a datum peg next to the wall can act as a level base. 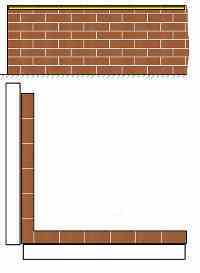 A bricklayer�s spirit level is used to keep the courses level. Because it is the corner bricks that have been set to the correct height, any adjustment should be made by bedding down the bricks working inwards from the corner. Bricks are not always manufactured to exact tolerances, so don't waste time trying to get each individual brick perfectly level. Place the spirit level on top of a row of freshly laid bricks and aim to get the bubble in the spirit level at dead centre. Don't worry about trying to get the bricks precisely level widthways. The spirit level is now used to check that the wall face is vertical. To make any adjustments, bricks should be gently tapped across the wall as necessary. 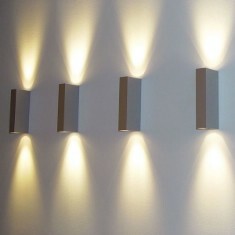 But don�t try and do this on both sides of the wall - choose one side as 'the face' and stick to getting that side plumb. Repeat this at regular points all along the wall, about every metre or so. At the corners, be sure to check both sides. To check that the courses are straight, run a horizontal line along them, or hold a straight edged piece of timber (or large spirit level) between the points you�ve just plumbed. Adjust the bricks by tapping them into place as necessary. As before, stick to one face of the wall, don't try to straighten both sides. If you�re using irregular shaped bricks, it is unlikely that your straight edge guide will touch each uneven brick surface across its whole face. So aim to get the centre of each brick to touch the straight edge guide. 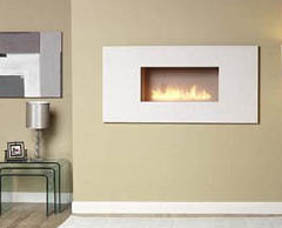 Since Victorian times, there have been strict regulations governing the construction of fireplaces. It had been discovered from bitter experience (1666 and all that) that without such precautions hot coals and burning logs falling from merrily blazing fires could, rather inconveniently, set fire to nearby timber floors. Although it is unlikely that your new fireplace will be built into anything other than a concrete ground floor, the rules still apply since combustible floor coverings meeting the hearth can very easily be set ablaze. So current Building Regulations are reasonably rigorous in anything to do with fire safety. Obviously it is fairly sensible to stipulate that fireplaces should be constructed from materials that protect your home from catching fire and burning down. In practice the main danger area is to the room immediately in front of the fireplace. This means that the hearth to the floor at the front of the fireplace must be at least 125mm thick, and made of an inert non-combustible material, such as concrete, brick or stone. The hearth should project no less than 600mm beyond the front of the fire opening, extending around the side returns to 150mm or more. As noted in chapter 9, the dark art of chimney and flue design can be surprisingly complex. Building a traditional open fire, or fitting a new heating appliance, means checking the implications for the flue, which must be the correct type for the fire. Essentially, in order to get a flue to draw properly a good supply of air is needed from the bottom, with small air bricks or pipes to outside. At the other end, the chimney pots need to be positioned clear of obstructions (such as the nearby roof ridge) to allow a reasonable flow of wind. As everyone knows, gas appliances must only be fitted by a competent CORGI- registered engineer, but it is only commonsense that any new heating appliance regardless of fuel type should be fitted by someone who knows what they are doing, and is suitably qualified to prove it. QUESTION: Which parts of the Building Regs apply when you fit new windows ?